When I first set out to write this sermon I was a little overwhelmed as at first it seemed to me to be one of the more difficult Gospel readings to write about and so I did what I always do when I’m stressed or worried about something; I prayed. It was then that the message itself began to be clearer to me and through the things that I have been going through at work lately, I began to understand What Jesus meant when he said. “Render to Caesar’s the things that are Caesar’s.” This reading began to have very profound meanings for me firstly, that we should only give to those not of our family (Christians) that which they rightfully deserve nothing more and nothing less because as said in Proverbs, “Do not weary yourself to gain wealth, Cease from your consideration of it.” (Proverbs 23:4) We as Christians and as Dominicans should do what we must to satisfy our means to survive in the secular world as we are members of this realm in life, but we should not over exert ourselves to satisfy those of this world because one day this world will cease to exist. We should instead work to do what satisfies the will of our Father through his son Jesus and not let ourselves to be lead astray by the Pharisees of the world. In this gospel reading the Pharisees are asking Jesus a question about paying taxes to catch him thinking he will either say yes to paying taxes which would not only put doubt on his allegiance to Israel but also could be considered breaking the second commandment as the money (Denarius) used to pay taxes not only had the head of Caesar but also called him ‘Divine’ there by committing idolatry; or that he would say not to pay taxes there by undermining the Roman government which could lead to his arrest. Not only does Jesus immediately sense their intent and scolds them saying, “Why are you testing me, you hypocrites? Through Jesus’ scolding of the Pharisees, we learn that we should not question or doubt the will of the Father and to do so is hypocritical because God always does what is right and just and so to question our Father’s will is to put us on the same rank as the Israelites who because, “the Lord’s anger burned against [them], He made them wander in the wilderness forty years, until the entire generation of those who had done evil in the sight of the LORD was destroyed.” (Numbers 23:13) We are shown that if we disobey Him however, that he will further teach us ways to understand his will so that we may reconcile ourselves to him. 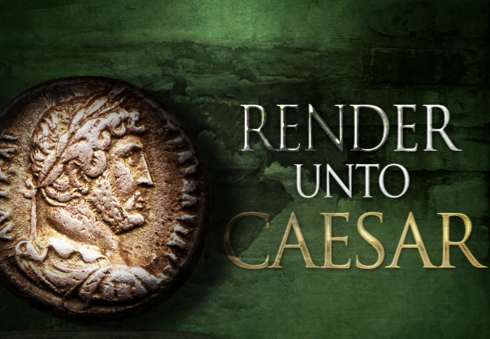 In making sure that we only have what we must to survive in the temporal realm and that we obey the law of the land by, ‘rendering to Caesar what is Caesar’s’ we will be able to better serve Him and build up our treasures in heaven rather than trying to cling to that which belongs to Caesar. Continue to guide us in ways that help us denounce those who try to entrap us and lead us in the ways in which we can leave our earthly possessions behind to take up our cross and follow you. We ask that the power of the Holy Spirit Guide us so that we may be claimed as heirs to your heavenly treasures and Eternal Kingdom by our redemption through your son our savior Jesus Christ.